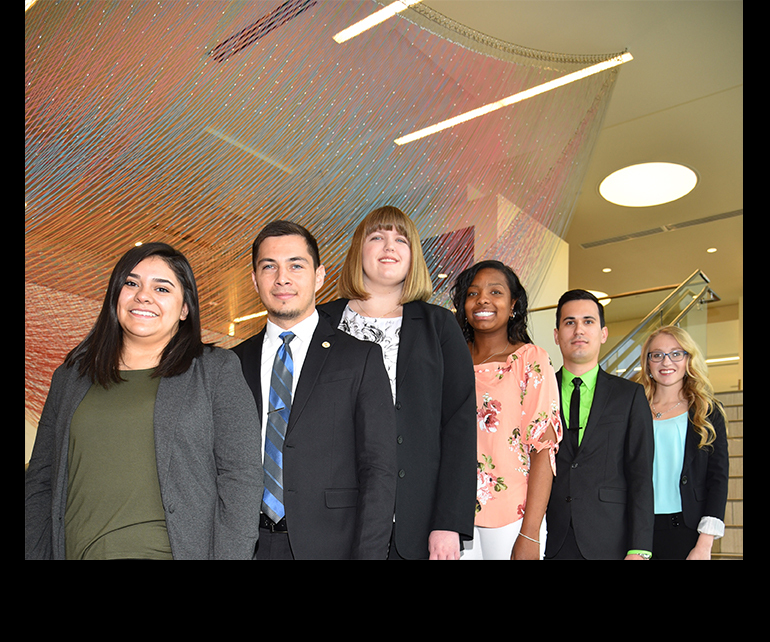 PUEBLO – Colorado State University-Pueblo will send six students to Washington, D.C. May 31-July 1 to intern in the nation’s capital through a partnership with the Smithsonian Institution. The six internships include housing covered by the university and a small stipend for expenses through an agreement that is the only one of its kind between the Smithsonian-at-large and a university in the state of Colorado. Some positions may be paid, and students also may earn up to three hours of internship credit for completing the experience. The interns will learn and work at a variety of Smithsonian facilities, including the Office of Protection Services, Digital Archives Management, Freer Gallery of Art, Traveling Exhibition Services, and the National Museum of African American History and Culture. A first generation college student from Pueblo, Teagan Boda is a junior with majors in history and political science and minors in psychology and Homeland Security and plans on attending law school. She will intern with the Smithsonian Institution Traveling Exhibition Service (SITES), where she will develop content for SITES traveling exhibitions for social media platforms such as Facebook, Twitter and Instagram. She also will develop social media campaigns for art, history, and science traveling exhibits. She will work with project teams and a variety of venues that include museums, cultural centers, university galleries and libraries. Boda has earned numerous scholarships and awards including the Leone Lindsay Scholarship. She also is a member of the National History Honor Society (Phi Alpha Theta), Golden Key Honor Society, and the National Psychology Honor Society (Psi Chi). Genesis Enriquez, Viles, CO, will graduate May 6 with a bachelor’s degree in business administration – economics with a finance emphasis. Enriquez will intern in the Smithsonian Facilities Digital Archives Management, where he will design new information management databases and learn about the facilities records management processes at the Smithsonian. He works as the Director of Internal Affairs for the Associated Students’ Government. He also is a mentor for the Upward Bound Program. While at CSU-Pueblo, he has been the recipient of a number of scholarships and awards including the Helen Mcloraine Scholarship and the Rutherford Foundation scholarship. Keragan Ettleman, a junior from Colorado Springs, is pursuing a degree in English with minors in Leadership Studies, Honors, and Communication & Rhetoric. She will intern in the education/outreach office of the Freer Gallery of Art and Arthur M. Sackler Gallery (FSGA). She currently works on campus as a Senator with the Associated Students' Government, as an office assistant for the Center for Teaching and Learning, and as a Zumba instructor with the Student Recreation Center Aerobics Team. Keragan hopes to pursue a doctoral degree and work in a university setting. Jelsea Ford, who will graduate May 6 with a bachelor’s degree in social work, has been placed at the National Museum of African American History and Culture (NMAAHC) as a Museum Membership Intern. In this position, she will learn the key elements of a museum membership program: fundraising, customer relationship management, data collection, analysis, and reporting. This fall, she plans to pursue a master’s degree in social work at Howard University and later to obtain a master’s degree in African American Studies. Matthew Hawkins is a senior graduating in December with a degree in political science and is a member of the Honors program. Hawkins has maintained a 4.0 grade point average while a student at CSU-Pueblo. A native of Kentucky, Hawkins graduated from Pueblo West High School and currently interns with the Colorado General Assembly for Representative Daneya Esgar. He also works as the Administration and General Counsel intern for the Pueblo West Metropolitan District. He plans to attend law school in the fall of 2018. Frankie Jaramillo, Colorado Springs, will graduate this month with a major in sociology and a minor in Chicano Studies. An intern at the Probation Office for the 10th Judicial District, she also has worked in the office of the University Provost at CSU-Pueblo since September of 2014. She has been a member of Alpha Sigma Alpha since the fall of 2013 where she has served as the scholarship chairman and the parliamentarian. Jaramillo has been accepted for graduate work in Ethnic Studies at CSU Fort Collins and is planning on applying to law school in 2018. She will be a paid intern in Security Force Management in the Office of Protection Services. The Smithsonian partnership provides a tremendous option for donors and potential donors to the CSU-Pueblo Foundation, who are seeking to directly impact students. Individuals interested in contributing to this fund should call the Foundation at 719-549-2380.